Product information "Triple Block Stripe Wool Tie - Navy / Green / Brown"
Macclesfield is usually considered as the capital of screen silk printing, but it's also possible to find a few outstanding woven fabrics there such as this. The hand of this wool fabric is a bit stiffer and drier compared to the Italian version. The tie knot is superb and similar to our usual repp or grenadine ties. If you're into fabrics with a structure, this is definitely a great choice. 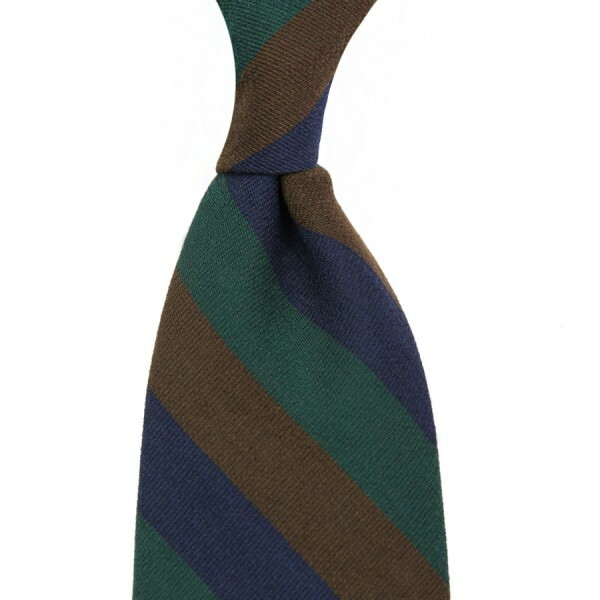 Related links to "Triple Block Stripe Wool Tie - Navy / Green / Brown"